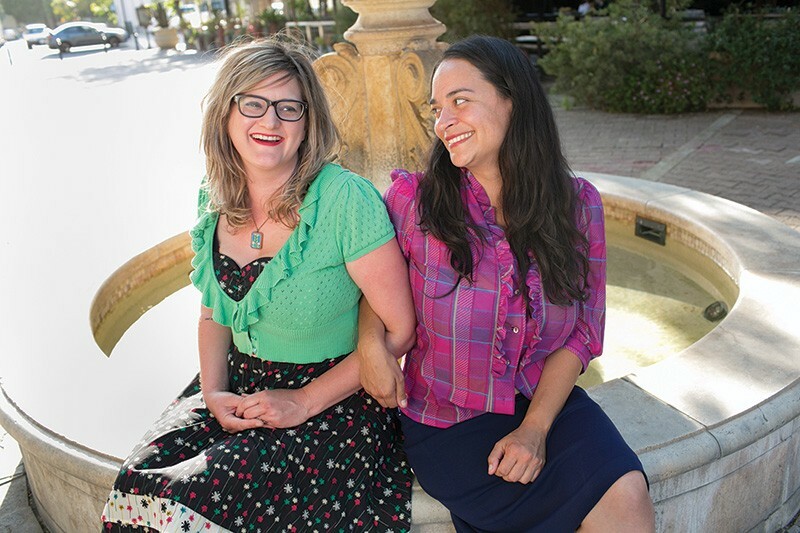 MEET YOUR MAKERS Nicole Stevenson and business partner Delilah Snell run two of California’s largest craft shows. Passing by Nicole Stevenson's house in a quiet Santa Rosa neighborhood, you'd never know that the backyard serves as the headquarters for a mini DIY empire. From her studio, she and her aunt and business partner, Delilah Snell, run two of California's biggest craft events, the Craftcation Conference and the Patchwork Show. Stevenson says she's never had a proper 9-to-5 job, but most of the time she's in the studio, working away. As the maker movement gained prominence over the last decade, the online crafts marketplace, spearheaded by Etsy, inspired such brick-and-mortar events as the Renegade Craft Fair, West Coast Craft and the Maker Faire. You won't find "Put a bird on it"–type crafts at these fairs, but highly polished and stylish wares. Stevenson, 38, wanted in on it. A graphic designer, illustrator and writer, Stevenson grew up in Los Angeles and moved to Sonoma County in 2000 to finish a master's degree at San Francisco State University. "I knew I'd rather live in Sonoma County than San Francisco, even though it meant commuting to the City several times a week," she says. After graduating in 2003, Stevenson decided to stay for good. "I wasn't about to give up afternoons at the Marshall Store, eating oysters on Tomales Bay or spending the day on the Russian River drawing in my sketchbook on the shore," she says. In the process of moving, Stevenson simply took all of her ventures with her. The idea for the Patchwork Show, a biannual makers festival with changing locations around California, was born in 2007. "When I started my own handmade business 14 years ago in Los Angeles," she says, "the DIY movement didn't exist the way it does now, and indie craft shows hadn't surfaced yet." A recent Patchwork show in Oakland attracted about 5,000 visitors and 150 vendors from all over the Bay Area. Craftcation, the annual four-day business conference, started five years ago after Stevenson realized that inspiration and guidance are just as important to the DIY scene as buying and selling crafts. "The feeling you get when you're in a place with so many other awe-inspiring creative types is overwhelmingly awesome," she says. Craftcations usually include workshops, lectures and other activities geared toward professionals, bloggers, aspiring makers and fans of the craft movement. The events take place in Ventura and turn local hotels into playlands for all things handmade. Having a business with multiple locations and receiving applications from dozens of makers yearly translates into a lot of traveling for Stevenson, who nevertheless calls Santa Rosa her (very stylish) home. "When I moved here from Southern California, I was surprised to find that Sonoma County has so much to offer with regard to the DIY and craft scene," she says, crediting the area's relaxed pace and lower cost of living for the flourishing entrepreneurial spirit. When she first moved here, Stevenson sold her goods at Santa Rosa's Shop Party events and taught workshops at local spots like StitchCraft in Petaluma and CastAway and Folk in Santa Rosa. Now she struggles to fit some community life into her schedule. Stevenson is now working on a series of online workshops and classes focusing on craft food and business savvy for craft-craving folks outside of California. She offers a DIY starter kit and related online courses and workshops. And how about a Sonoma County crafts fair? It just may happen. "This is definitely something we've thought about," says Stevenson, "but we're also keeping in mind the logistics of doing a show in an area that's so spread out, where each city has its own strong sense of community." The mindset and demand, she knows, are there. "What materials are used to make the things we purchase," Stevenson asks, "and are those materials harmful for us or our environment? How is our food sourced and grown? People are moving toward a more conscious way of living, asking questions previous generations didn't ask."